Copying at its most obvious. If you're looking for a prime example of how the three guys from Scooter lack a certain level of creativity sometimes, look no further than right here. Scooter has always been known for taking more than their fair share of "inspiration" from other sources, but often I don't mind because they either bring relatively unknown melodies to the mainstream forefront or tweak the ideas in their own direction to develop something unique. "I'm Raving" does neither of these things. 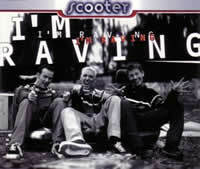 The title track, "I'm Raving", takes its main inspirations from several sources. The first is a classic adult contemporary tune, "Walking In Memphis" by Marc Cohn. One of the two melodies is from this song, but the lyrics are actually from another song by Shut Up And Dance who created a similar dance version, "Raving I'm Raving", replacing the old lyrics with new, more jammin' ones. Scooter has sampled more than generously from these, ultimately coming up with an end product that really has no creative input on behalf of the group members whatsoever. The other half of the song comes from "Scotland The Brave", a famous Scottish anthem; it is used here in conjunction with some acid synth noises. So together, Scooter did very little and managed to get a hit out of this track. Gee, usually they at least TRY to add something new, but they couldn't even handle something as simple as that. This is Scooter's ripping policy at its most obvious, and it's despicable here, to be honest. As I mentioned earlier, I don't mind when they snag something from here and there, but when that takes up the vast majority of the song, I have to draw the line. The Radio Edit and Extended Version are pretty much the same, except they managed to drag it out a minute and a half longer for the extended one. I'm not saying that it's a bad song (it is fairly listenable, yes), but they shouldn't get much credit for it. The B-sides here are not all that great either. B-Site (www.mix) basically takes all the original instrumental parts and combines them together into a five-point-five minute rehashing with nothing new or exciting taking place. I also don't understand why it's called the "www.mix" -- is that supposed to be an internet reference or something? Well, it really doesn't matter because this track is nothing special. The same goes for the second B-side, Loops And Pipes, which is very short and uninteresting. This is essentially the introductory track from their artist album, "Wicked! ", just without Scooter shouting the word "wicked" over top of it. Why did we need this? Overall, there is much disappointment to be had with Scooter's display here. All the ideas have been scooped from the minds of others (and unfortunately, these aren't obscure musical borrowings either), and so I can't grade this single very high. Thankfully, this type of production method has not become an absolute formula for Scooter, so other releases are therefore naturally inclined to get a better rating.